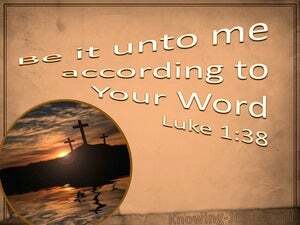 ﻿ Luke 1:38 "I am the Lord's maidservant," Mary replied; "may it be with me in accordance with your words!" And then the angel left her. "I am the Lord's maidservant," Mary replied; "may it be with me in accordance with your words!" And then the angel left her. And Mary said, "Behold, the bondslave of the Lord; may it be done to me according to your word." And the angel departed from her. "I am the Lord's slave," said Mary. "May it be done to me according to your word." Then the angel left her. Then Mary said, "Truly I am the Lord's servant. Let everything you have said happen to me." Then the angel left her. And Mary said, Behold the maid-servant of Lord. May it happen to me according to thy word. And the agent departed from her. And Mary said, Behold, the handmaid of the Lord; be it unto me according to thy word. And the angel departed from her. Then Mary said, Behold, I am the handmaiden of the Lord; let it be done to me according to what you have said. And the angel left her. And Mary said, "Here I am, the Lord's slave-girl; let it happen to me according to what you say." Then the angel left her. And Mary said: Behold the handmaid of the Lord; let it be to me according to your word. And the angel departed from her. And Mary said: I am the servant of the Lord; may it be to me as you say. And the angel went away. Then Mary said, "Behold, I am the servant of the Lord; let it be to me according to your word." And the angel departed from her. then said Mary, "behold the servant of the Lord, be it unto me according to thy word." upon which the angel disappeared. And Mary said, Behold the bondmaid of the Lord; be it to me according to thy word. And the angel departed from her. And Mary said; Behold the handmaiden of the Lord; may it be done unto me according to thy word. And the angel went away from her. And Mary said, "I am the Lord's slave. Let it be as you say." Then the angel left her. And the angel departed from her. Then Mary said, Behold the handmaid of the Lord; be it unto me according to thy word. And the angel departed from her. And Mary said Behold the servant of the Lord; may it be to me according to thy word. And the messenger departed from her. And Mary said, Behold the handmaid of the Lord; be it unto me according to your word. And the angel departed from her. So Mary said, "Behold, the Lord's female slave! May it happen to me according to your word." And the angel departed from her. And Mary said, Behold the servant of the Lord. Let it be to me according to your word. And the angel departed from her. And Mary said, "Behold the handmaiden of the Lord, be it unto me even as thou hast said." And the angel departed from her. Mary said, "I am here to serve the Lord. Let it be as you have said." Then the angel went away. Then Mary said: "Behold I am Lord's slave. Let it be to me as you have said." Then the angel departed from her. So Mary said, "Yes, I am a servant of the Lord; let this happen to me according to your word." Then the angel departed from her. And Mary said, "See, the handmaid of the Lord; be it to me according to your word." The angel departed from her. And Mary said, Lo, the handmaid of the Lord! May it be to me according to thy word. And the angel departed from her. And Mary said, Behold, I am the servant of the Lord! Let it be to me according to your word. And the angel departed from her. And Mary said - Lo! the handmaid of the Lord! Might it come to pass unto me, according to thy declaration. And the messenger departed from her. Then said Mary, Behold a servant of the Lord, be it to me according to thy declaration. And the angel departed from her. "I am the servant of the Lord," exclaimed Mary; "let it be with me as you have said." Then the angel left her. And Mary said, Behold the handmaid of the Lord, be it to me according to thy word. And the angel departed from her. Then Mary said, "I am the Lord's slave. May what you say take place with me." Then the angel left her. Mary said, "Behold, the handmaid of the Lord; be it to me according to your word." The angel departed from her. And Mary said, "Behold, the handmaid of the Lord; may it be to me according to your word." And the angel departed from her. Then Mary said, Behold the servant of the Lord, may it be unto me according to thy word. So the angel departed from her. And Mary said, 'Lo, the maid-servant of the Lord; let it be to me according to thy saying,' and the messenger went away from her. 37 For no promise from God will be impossible of fulfilment." 38 "I am the Lord's maidservant," Mary replied; "may it be with me in accordance with your words!" And then the angel left her. 39 Not long after this, Mary rose up and went in haste into the hill country to a town in Judah.